Here’s another recipe that I made awhile back, and was meaning to tell you about. 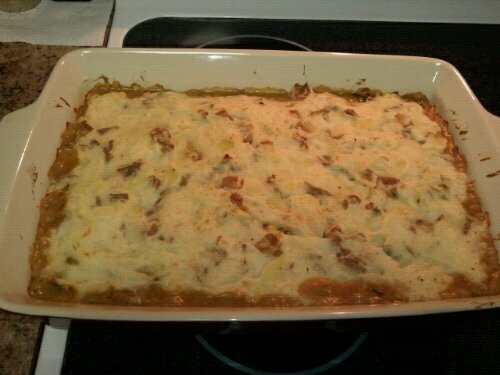 It’s the Tempeh Shepherdess Pie pg. 167, from the Veganomicon cookbook. We were having another couple over for dinner, and I decided to go for a big pan of vegan comfort food lovin’ for our guests. This recipe does not dissapoint. I’ve often stated that I have an aversion to mushrooms, but over time I’ve realized that they add a really nice flavor, and if I chop them up finely enough, they don’t even bother me! So that’s exactly what I did here with the 8 oz/3 c. of mushrooms called for. I have been using baby bellas or shiitakes, in this case I used the former. Tweaks: I added some liquid smoke to the tempeh mixture, and some nutritional yeast to the mashed potatoes based on reading some reviews. I think these were wise choices, as they upped the flavor ante. Nutritional yeast really makes mashed potatoes spectacular, and I always use it when I make them. Oh, and I used canned peas, because that’s what I had, and Braggs for tamari/soy sauce. Results: This is true comfort food right here. Hot food for a crowd that you’re proud to serve and really isn’t all that hard to make. Perfect for weeknight entertaining. ← Cheesy Beefy Vegan Nachos Too! I am making this tonight! I found it in the cookbook and googled the recipe title hoping to find a pic because, honestly, I have no idea what even regular Shepherd’s Pie is supposed to look like! Sure! It’s really good and filling, and makes a lot.